I love Little Debbie Oatmeal Creme Pies and I'm not afraid to admit it. 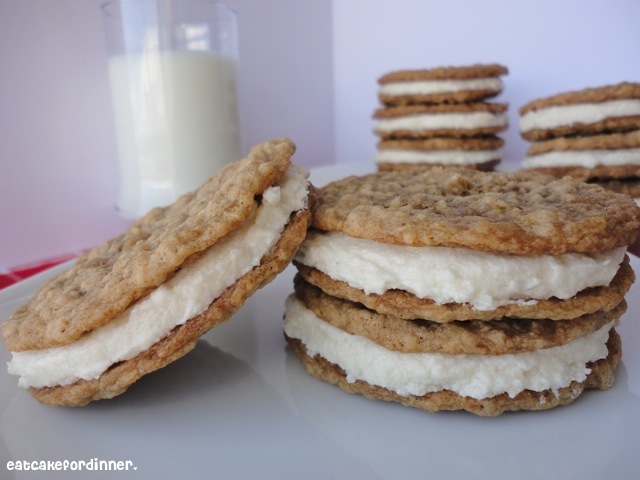 Like any other sweet treat, homemade is almost always better than store bought. I had seen a ton of versions of this famous treat and they all sounded great and the photos were all mouth-watering that it was almost too hard to pick one to try and that is why it took me so long to finally just pick one and give it a go! I went with the recipe that didn't have the most butter, but didn't have the least and I went with one that had all brown sugar, because brown sugar makes a super soft cookie and that is what I was looking for. I decided to ignore all of the cream filling recipes and go with one of my favorite frostings. It is the original recipe that I based my Whipped Eggnog Frosting off of. It is the lightest frosting and it has a great texture and flavor. I know it is different than the store-bought version, because I saw an episode of Unwrapped and it showed us that the real cream filling is made with shortening, powdered sugar, corn syrup and vanilla flavoring and they whip air into that. Whichever type of filling you decide to go with, these will be delicious either way! I LOVED these Homemade Oatmeal Cream Pies! Preheat oven to 425 degrees. Lightly grease a baking sheet and set aside. Cream butter and sugar until light and fluffy. Add eggs and mix to combine. In a separate bowl, sift together the salt, flour, baking powder and cinnamon. Add to the creamed mixture. Add the oats and mix until combined. In a small dish, add the baking soda to the boiling water and stir into the rest of the batter. Drop by the Tablespoon onto baking sheets, about 2-inches apart and bake until the cookies are just starting to turn golden around the edges, 8-11 minutes. Cool the cookies on a wire rack. Once completely cooled, spread vanilla frosting over flat side of one cookie and top with the flat side of another cookie. Repeat. Yield: around 44 cookies or 22 sandwiches. Jenn's Notes: I made a half a batch of both the cookies and the frosting. I typed the recipe above with the measurements that I used. The cinnamon is needed to help these taste like the store-bought ones, so don't leave it out. I baked my cookies for 8-9 minutes. (Remember you want them to be soft). Don't judge the sandwiches the first night you make them, they really need to sit overnight in order to taste like a store-bought oatmeal cream pie. They are delicious and I can't stop eating them! These look so delicious. I can almost taste them! YUM! I have to pin these. mmmm, these must be so wonderful homemade! These look fantastic! Saw you on Think Pink Sunday! 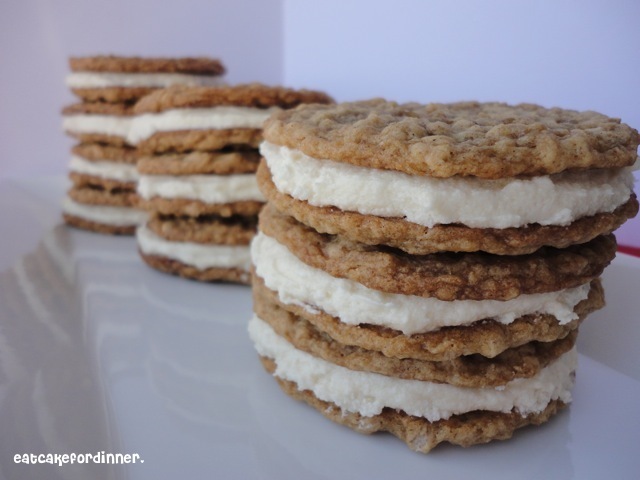 I love oatmeal cream pies, and these look quite yummy. Homemade is best. They look wonderful and I'd just looooooove to grab some right now! 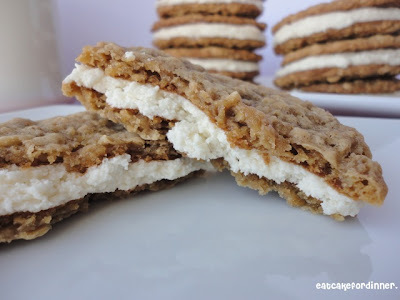 I'm really getting into oatmeal cookies and I just love brown sugar anyway! These cream pies look fab, can't wait to try them! I love oatmeal cream pies, so I really want to try this one! They look even better than the store bought ones. :-) Clicked over from the Nifty Thrifty Sunday #48 link party. What a fun cookie. I don't think I've ever had an oatmeal cream pie. Wow, those look amazing!! My girls would love me for making them. :) Thanks for sharing. I don't see a pin it button...could I pin them on my board? I would love for you to pin this to your board! These look delicious! I'm going to have to try them! The best part is that you can add as much of the frosting as you like. The store bought ones are always a little skimpy on the frosting layer! I totally agree- I love loads of frosting! Yum! I love oatmeal cream pies. These look delicious! I'm visiting from Serendipity and Spice. Have a lovely day! Just shared these on Facebook. They look amazing! Thanks for sharing at Mom On Timeout! My husband loves cream pies. I think I'll use these as a bday present. Thanks for the recipe! You're being featured tonight - thanks for sharing! PS: I am your newest Linky Follower! If I follow your frosting recipe do the completed pies need to be refrigerated?